Hailing from England, Mike toured Europe and the Far East and lived in Hong Kong for 4 years before finally settling into his adopted home, San Francisco, in 1977. Well known in his role as musical director to acclaimed vocalist Wesla Whitfield with whom he has recorded twenty albums, Mike is also resident piano player on Sedge Thomson’s weekly Public Radio show to the world, “West Coast Live” – more info at wcl.org. Mike can also be caught playing jazz with his trio in many a Bay Area saloon and jazz club. Mike has accompanied such diverse talents as Rita Moreno, Margaret Whiting, Broadway stars Lillias White and Franc D’Ambrosio and jazz singers Madeline Eastman, Ann Hampton Callaway and Opie Bellas. Mike’s latest CD, The Mike Greensill Trio Live at the Plush Room is available on-line at CD Baby and Amazon.com. In January 2014 Mike published his magnum opus “Playing for Singers” bringing his many years of accompanying experience to bear in exploring, in detail, the ins and outs of the accompanist’s art as it applies to the performance of the “Great American Songbook”. Now a resident of St. Helena in Napa Valley’s wine country, his skill and talent as a solo artist is demonstrated weekly at Silo’s nightclub in Napa where his knowledge and history of American songbook as well as delightful singing skills are performed with both wit and grace – to the delight of his loyal and ever-growing audience. 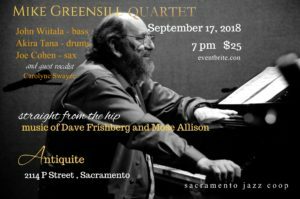 “Greensill is an accompanist in the great tradition of Jimmy Rowles and Ellis Larkins. Carolyne Swayze, is a vocalist hailing originally from Chicago. Blending jazz and pop standards from the American Standard Songbook, she delivers a sophisticated and mellow style. 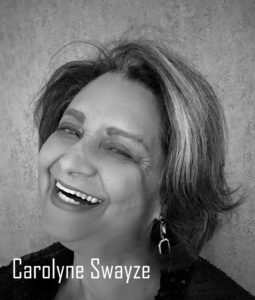 An experienced performer, Carolyne worked extensively throughout the San Francisco region on the hotel and country club circuits, and most notably for five years at the San Francisco Hyatt Regency with the Jimmy Diamond Band. Today, as she enters what she refers to as the “fourth quarter” of her life, she is also an impressive songwriter, and although semi-retired she still performs on occasion, with an innovative and identifiable style. 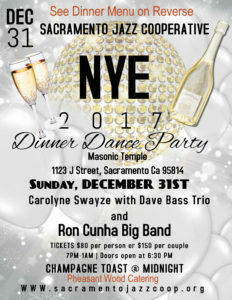 In 2016, she formed the Sacramento Jazz Cooperative (Sacramento Jazz Coop) and serves as CEO of the organization dedicated to preserving classic jazz as an American artform.